Last Friday I received a Panasonic Core Trainer to try for 30 days. After that I can purchase it or send it back. My interest in it was first raised when I saw they had developed it in Japan (called the JOBA). For physical rehabilitation, horse riding can be a component. It can help to improve the core muscles in an active way. There are horse riding stables that specialize in this area around the country. When I lived in WV, as far as I knew, there weren’t any in the area. After moving to Kansas, I was told about a place about 45 minutes away. I visited there and spoke with the trainer. A lot of the talk focused on the potential risk of falling. This emphasis was off-putting (and they had an incident where a horse was startled with a patient riding him) so I didn’t take it up. Some time after that, I saw that Japanese researchers had created this. I thought it would be something that could help me strengthen my core (maybe I’ll be able to take a punch to the stomach :)). It took a bit of time for it to show up in the United States and it had a large price tag. It wasn’t something I could just buy and hope it works well. It doesn’t seem to have penetrated at all here in Kansas. Not in local gyms or at any rehabilitation facilities. I then saw it was in use at the Center for Spinal Cord Injury Recovery in Detroit. I figured if they were using it there, then it must be something I could use. I spoke with someone who was monitoring the use of the device there and was told that quadriplegics and paraplegics were using it with good results. One other concern I had prior to getting it was getting on and off of it. One feature that would help is if it was height adjustable (either manually (adjustable when not in use) or electronically (adjustable during use). Unfortunately, it isn’t. 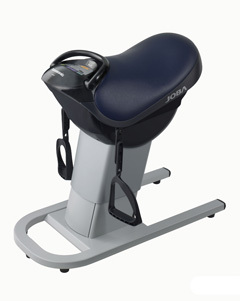 I do a stand-pivot transfer from my chair to the Core Trainer. I have to be sure to stand tall before sitting down or I will be on the edge. Because it has a rounded seat, you want to be sure to get to the crest or beyond. I’m 5’9″ – 5’10” tall. I’m guessing that around 5’6″ might be the threshold to be sure you can sit down on it without worrying you may slide off. I definitely don’t see being able to get on it without help. You still need to swing your leg over to the other side and one of the last things you want to do is lean backwards without any support. I started using it last week and wasn’t sure what I should do. I started slow and over the course of a few days I sped it up to see how fast I could handle. I managed to get up to the sixth speed of nine levels. I also ride it with my feet touching the ground and without any additional forward or backward tilt. Around Wednesday the left side of my ribs were hurting. The likely cause was the Core Trainer. I also learned that it’s better to go slow and try to sit up (and stay up) as tall as possible for the greatest affect. Riding it has been fun. I definitely can feel my core muscles working (and they were totally tired out at the higher speed). I plan to get back on it tomorrow (my ribs are feeling a lot better), but use it at the slowest speed. I just got a new mirror so I can watch my posture as I ride it. I found that I maintain a lot better balance by looking straight ahead. If I look down at the display/controls my posture and balance worsen. The mirror should help me stay as straight and tall as possible. I received a couple DVDs today on how to use it effectively. There should be some very good information on them. They show people riding it with their legs in the air (not on the floor, dangling or in the stir-ups) and not using the handle. I think I’m a long way from that. I wouldn’t even think about not holding the handle. One of the reasons I posted about the Core Trainer (and plan to continue to) is that I couldn’t find a testimonial that was relevant to my planned use. I’m hoping this will be helpful to others trying to find this information. Your review on Joba was a big help to me. I have been trying to find a consumer’s review after a real excercise, and yours were really good. Did you buy this Joba after all? And was it a big help to your core muscle? I continue to use the core trainer, but it has been an up and down road. It has helped my core, but I do have periods where I don’t use it because of pain (the pain isn’t from the core trainer). So if my muscles/body are hurting, I lay off for a bit and fall out of my routine and have to start all over. For a period, I was alternating its use with walking and that was going well until I started to have a lot of random muscle pain. It’s a very good work out and keeps your muscles active. Much more than I can get from daily activities and it’s very efficient vs. straight exercises. They do not appear to be sold widely, but is still available directly from Panasonic. It’s a newer model than the one I have and has more features. MSRP is $2000.